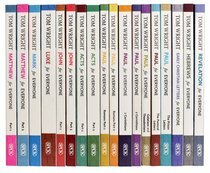 This limited edition set contains all 18 volumes in Tom Wright's best-selling New Testament for Everyone series of biblical commentaries, in canonical order. All books are separate, but packaged together. About "Ntfe: For Everyone Complete New Testament Commentary (18 Vols)"